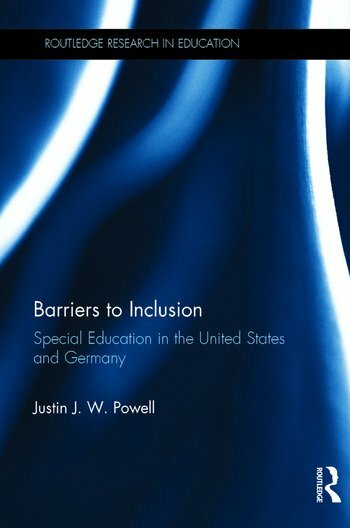 Barriers to Inclusion offers a comparative and historical account of the rise of special education over the twentieth century in the United States and Germany. This institutional analysis demonstrates how categorical boundaries, professional groups, social movements, and education and social policies shaped the schooling of children and youth with disabilities. It traces the evolution of special education classification, explores growing special education organizations, and examines students' learning opportunities and educational attainments. Highlighting cross-national differences over time, the author also investigates demographic and geographic variability within the federal democracies, especially in segregation and inclusion rates of disabled and disadvantaged children. Germany's elaborate system of segregated special school types contrasts with diverse American special education classrooms mainly within regular schools. Joining historical case studies with empirical indicators, this book reveals persistent barriers to school integration as well as factors that facilitate inclusive education reform in both societies. Foreword by Karl Ulrich Mayer 1. Disability and Special Education over the Twentieth Century Part One: The Construction of Special Education Organizations and Disability 2. Comparing (Federal) Education Systems: Ideologies, Institutions, and Interests 3. Compulsory Schooling for All Children: Structured Learning Opportunities in Special Schools (Germany) and Special Classes (United States) 4. Classifying "Special Educational Needs": Categorical Boundaries of Student Disability and Disadvantage Part Two: The Development of Special Education Systems: Isomorphism, Expansion, Inertia 5. Germany's Special Schools since 1900 6. Special Classes in the United States since 1900 7. Comparing German and American Special Education Systems Part Three: Barriers to Inclusive Education 8. Institutional Barriers to Inclusion 9 Inclusive Education for the Twenty-first Century?